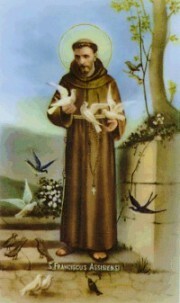 These prayers are attributed to Saint Francis of Assisi. They provide comfort and strength to people having problems. Most High, all-powerful, good Lord, Yours are the praises, the glory, the honor, and all blessing. Praised be You, my lord, with all your creatures, especially Brother Sun, Who is the day and through whom You give us light. And he is beautiful and radiant with great splendor; and bears a likeness of You, Most High One. Praised be You, my Lord, through Brother Wind, and through the air, cloudy and serene, and every kind of weather through which you give sustance to your creatures. Praised be you, my Lord, through our Sister Mother Earth, who sustains and governs us, and who produces varied fruits with colored flowers and herbs. Praised be you, my Lord, through those who give pardon for your love and bear infirmity and tribulation. Woe to those who die in mortal sin. Blessed are those whom death will find in Your most holy will, for the second death shall do them no harm.